BLACK CUMIN SEED OIL HAS A HIGH AMOUNT OF VITAMIN A, B AND C AND MINERALS INCLUDING POTASSIUM, COPPER, ZINC AND SELENIUM. IT HAS BEEN USED AS AN ALL PURPOSE MEDICINAL OIL FOR CENTURIES IN ASIA AND MIDDLE EASTERN COUNTRIES. MARULA OIL IS RICH IN ANTIOXIDANTS AND ESSENTIAL FATTY ACIDS. MARULA OIL HAS BEEN FOUND TO SIGNIFICANTLY IMPROVE SKIN HYDRATION, SOFTNESS AND SMOOTHNESS. COLD PRESSED CASTOR OIL IS HIGHLY ANTIBACTERIAL AND ANTIMICROBIAL. GENTLY DISSOLVES OIL AND REMOVES DIRTY DEPOSITS IN YOUR PORES. TEA TREE OIL IS A KNOWN ANTIBACTERIAL. ORANGE ESSENTIAL OIL PROVIDES AND UPLIFTING SCENT AND BENEFICIAL ASTRINGENT PROPERTIES. PRESERVATIVE FREE. 100% NATURAL INGREDIENTS. Apply approximately one teaspoon of oil to palms of hands and massage into face in circular motions. If time allows, apply hot wash cloth to face and let set for a few minutes. Gently wipe away oil with wash cloth. Follow up with FACE TONIC and BOTANICAL FACIAL OIL. 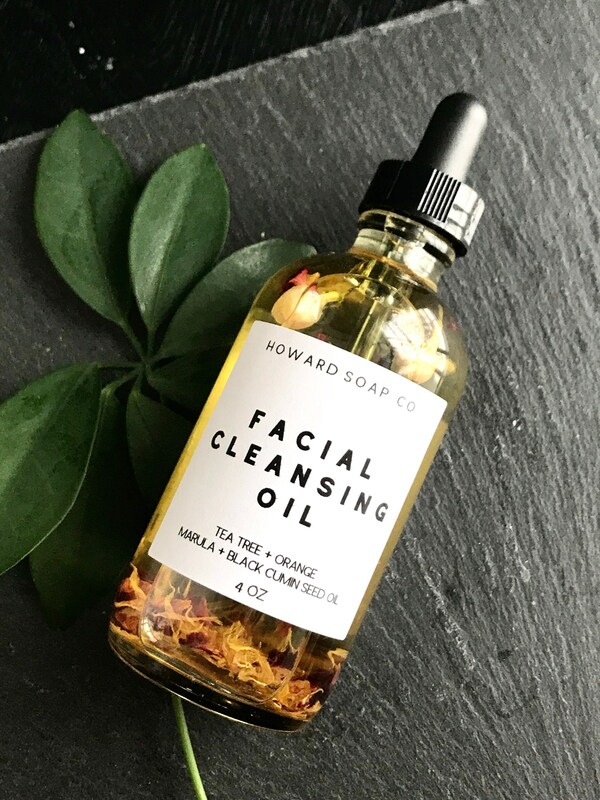 The basic concept of this cleansing method is that the oil used on your skin will dissolve the oil that has hardened with dirt, make up and other impurities and has found itself stuck in your pores. The steam will open your pores, allowing the oil to be easily removed. 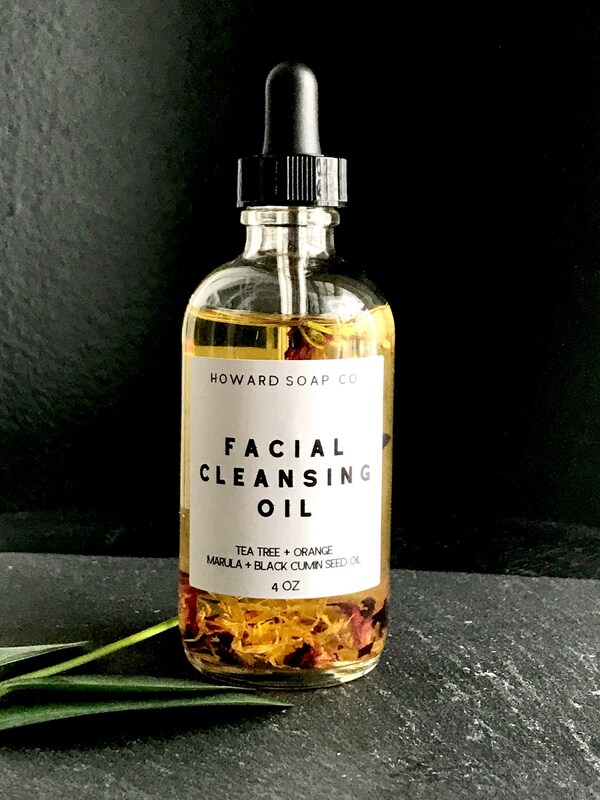 INGREDIENTS: safflower oil, marula oil, black cumin seed oil, castor oil, avocado oil, tea tree essential oil, orange essential oil, jasmine flowers and rose petals. ALL PRODUCTS MADE ON OUR SMALL FARM WITH MATERIALS FROM US DISTRIBUTORS.